Netflix has unveiled the first look at Henry Cavill as Geralt of Rivia in The Witcher series. Lauren Schmidt Hissrich is adapting Andrzej Sapkowski's popular fantasy novels for the streaming platform. The show has been in development for quite a while, but it was announced in 2017 that Hissrich was on board and it was later revealed in September of this year that Henry Cavill had officially signed on to star in the series. As for a release date, it is believed that Netflix will premiere the show some time in 2019. Both Netflix and Henry Cavill shared some test footage for The Witcher series, putting the actor front and center as Geralt of Rivia. Cavill has the long white hair that the character is known for along with the orange eyes. The clip starts off in the dark as Cavill walks towards the camera, stops, and then takes out a vial to take a swig from some mystery potion. All in all, Cavill's take on Geralt takes a lot from the source material. 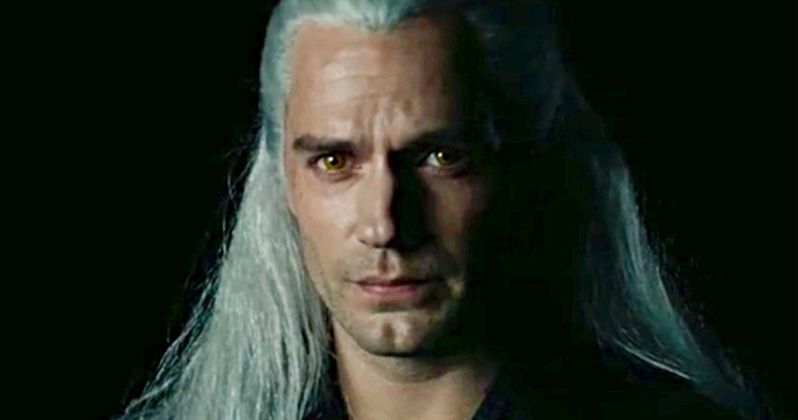 Fans have pointed out the Henry Cavill's Geralt of Rivia is clean-shaven and that he doesn't have the iconic scar that the character is known for in the video game adaptation. However, it's believed that The Witcher series will explain how the character received the scar. As for the facial hair, the Rivia is clean-shaven in Andrzej Sapkowski's books, so the Netflix series seems to be going from the original source material, rather than the popular video games. That doesn't mean that we won't see some facial hair on Cavill in the show. Let's just hope that they take care of it better than Warner Bros. did with Justice League. In addition to the first-look at Henry Cavill as Geralt of Rivia in this new streaming series, it was revealed that The Witcher will also star Eamon Farren as Cahir, Joey Batey as Jaskier, Lars Mikkelsen as Stregobor, Royce Pierreson as Istredd, Maciej Musiał as Sir Lazlo, Wilson Radjou-Pujalte as Dara, and Anna Shaffer as Triss. The new cast members join the previously announced Freya Allan as Ciri, Anya Chalotra as Yennefer, Jodhi May as Calanthe, Björn Hlynur Haraldsson as Eist, Adam Levy as Mousesack, MyAnna Buring as Tissaia, Mimi Ndiweni as Fringilla, Therica Wilson-Read as Sabrina, and Millie Brady as Renfri. The show is packed to the brim with awesome talent. The Witcher will see Henry Cavill's Geralt of Rivia, as a solitary monster hunter as he struggles to find his place in a world where the people around him aren't always the best. However, when a powerful sorceress and a young princess with a dangerous secret approaches him, the three join forces and learn to navigate the increasingly volatile Continent together. Netflix has set the bar pretty high, and fans of Andrzej Sapkowski's source material are going to be watching very carefully when the series debuts. While we wait for a release date, you can check out the first look at Geralt of Rivia below, thanks to Henry Cavill's Instagram account.